Gum disease is the leading cause of tooth loss in adults. While the causes of this infection are many–hormonal changes, illnesses, medications, smoking, family history and poor oral hygiene–it can often be prevented, or stopped before it progresses from gum inflammation (gingivitis) to gum disease (periodontitis). First, bacteria in plaque build up, causing your gums to become inflamed and even bleed when you brush your teeth. Then, if the gingivitis is not treated, the inner layer of the gum and bone can pull away from the teeth and form pockets. These spaces collect debris and can become infected. Toxins produced by the bacteria as well as the body’s infection-fighting enzymes start to break down the bone and connective tissue that hold teeth in place. Finally, as the pockets deepen and more gum tissue and bone are destroyed, the teeth become loose, and can fall out. It isn’t always easy to tell if you have gum disease; you might not have any pain. But there are some warning signs. If your gums bleed, are red, swollen or tender, or they seem to be receding, you might have gingivitis. Bad breath and/or a bad taste in your mouth are also symptoms. 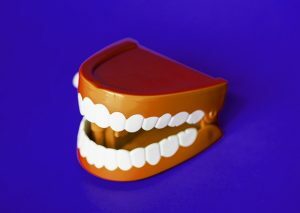 If your teeth seem to be shifting, don’t seem to fit together when you bite, or your partial dentures aren’t fitting properly, you could have gum disease. And, of course, loose teeth are a red flag. This is why it is so important to see your dentist or periodontist twice a year for cleanings. He or she will check for gum bleeding, swelling, and firmness; look at the spaces between your teeth and gums; assess teeth movement, sensitivity and alignment; and note whether there is any breakdown of bone around your teeth. If you have extensive plaque and tartar under the gums, a nonsurgical procedure called scaling and root planning can be done under local anesthesia. In addition to removing the plaque and tartar, this process also smooths rough spots on the tooth root. This removes bacteria and leaves a clean surface to help the gums reattach to the teeth. If tartar has damaged the gums or bone, you may need surgery. One procedure, called flap or pocket reduction, involves lifting back the gums, clearing away the tartar, and smoothing the bone to take away places bacteria can hide. The gums are then replaced closer to the teeth than before, decreasing the areas where harmful bacteria can grow. When gum and/or bone loss is severe, soft tissue grafts or bone grafts, or bone reshaping may be needed to stimulated regrowth. Antibiotic treatments or special toothpastes can be used with any or these treatments, or alone, to reduce bacteria or suppress the destruction of the tooth detachment. While gum disease can be treated, it is far better to prevent gingivitis from progressing to periodontitis than it is to treat the full-blown disease. Plaque control is critical. Getting a professional cleaning twice a year, and brushing and flossing daily keep plaque from building up on your teeth, between teeth, and under the gum line. Antibacterial mouth rinses can also help. During your regular checkup, your dentist or hygienist will scrape away the plaque and tartar (hardened plaque) above and below the gum line. If you have early signs of gum disease, your dentist may ask you to schedule cleanings more than twice a year. If you have been told you have gum disease, or think you might, we would be happy to provide a second opinion. Call Wilmington Oral Surgery to make an appointment.